The 2018 National Preparedness Month logo. 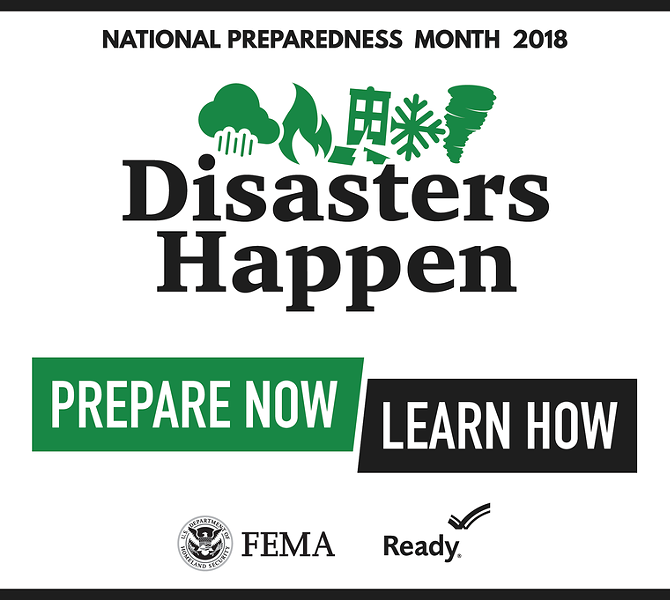 September is National Preparedness Month which reminds everyone to prepare themselves, their communities and families from now and throughout the year for disasters that could happen. Prepare in advance to any situation by improving your skills such as CPR and first aid. The Federal Emergency Management Agency, or FEMA, is encouraging people to get involved on social media by helping others understand the need to prepare for emergencies. In 2017, Hurricane Harvey left the nation devastated. About 80 percent of households impacted by Hurricane Harvey did not have flood insurance.